On remembrance Sunday, Derbyshire green party chairwoman Sue Ledger and I visited the Animals in War memorial on Park Lane, London. 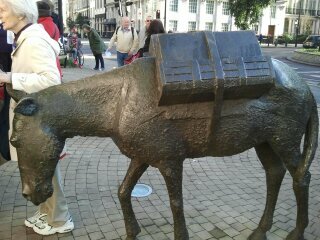 It’s an impressive monument – a curved stone wall with images of various animals, along with two heavily laden bronze mules progressing up the stairs of the monument, and a bronze horse and dog beyond it looking into the distance. 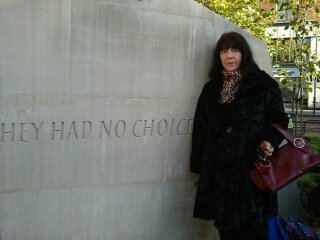 It bears several inscriptions, but the one that struck straight to the heart for both of us was “They had no choice”. A more fitting statement also for many of those humans who lost their lives to war than the words inscribed on the Cenotaph – “The Glorious Dead.” Other inscriptions on the memorial are less clear about the exploitation of animals for war – an exploitation that continues today as dogs and dolphins are trained to detect mines. On the far side of the monument we read that animals “played a vital role in every region of the world in the cause of human freedom”. We arrived at the monument at 10.30 and It was a moving experience to join with others in remembering these victims of war who are not so much forgotten as simply disregarded. The general direction of the service, however, was a romanticised vision of animal heroism rather than a reflection on the suffering of these animals and the morality of forcing them into wars that for the most part have little to do with human freedom, and certainly have nothing to do with animal freedom. Perhaps it is natural to search for something positive in the face of loss and suffering, but war must not be seen as glorious either for humans or animals. To quote Harry Patch, last surviving veteran of World War I, who died in 2009, “War is organised murder and nothing else”. Remembrance day is important and should be marked as a time of mourning for all those who have died in wars, not because they were heroes but because they were living beings whose lives were cut short. It should also be a time for regret and shame that we continue to consider war and preparation for war as acceptable. For all humans and animals who have died, or are dying in wars. For all those who have died or are dying because resources to feed or house them have gone to war preparations. For all those who will die until we learn to live in peace. This entry was posted in Events, Issues, National, Peace & Human Rights and tagged Animal rights. Bookmark the permalink.